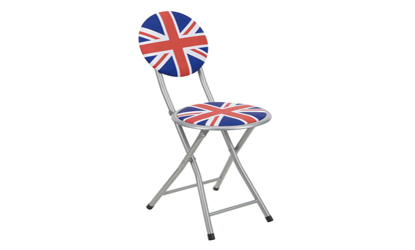 Union Jack design folding chair, perfect for extra guests and space saving requirements. Small and sturdy with a Union Jack print design, the metal folding chair can be used outside, on balcony, patio or as a cool kids bedroom or desk chair. Great to give your guests a place to sit to join your celebrations for the Queen`s Jubilee or Olympic events. Padded for extra comfort, with study modern design, the metal folding chair is light enough to easily move around and store.